Bengaluru: Senior journalist Gauri Lankesh, an outspoken critic of Hindutva politics, was shot dead here on Tuesday, police said. Karnataka police chief R K Dutta said Lankesh was shot dead by unidentified assailants at the entrance of her residence in Raj Rajeshwari Nagar. Lankesh, in her 50s, edited a Kannada tabloid 'Gauri Lankesh Patrike' besides owning some other publications. Dutta said Lankesh had not voiced apprehension about any threat to her life during a couple of meetings he had with her. Asked about who could be the possible suspects in the killing, the officer refused to hazard any guess, saying "let the investigation proceed first." Chief Minister Siddaramaiah condemned the crime. 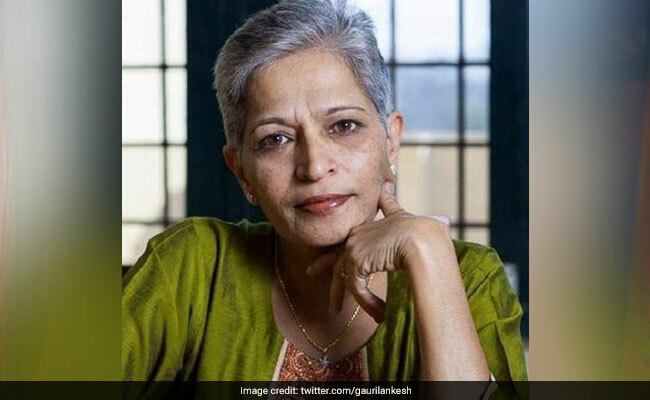 "Absolutely shocked to learn about the murder of renowned journalist Gauri Lankesh. I have no words to condemn this heinous crime," he tweeted. "Gauri was an advocate of secularism. She fought against injustice," he told the media here. "Police has formed three teams and begun investigations," Siddaramaiah said, adding that he had directed police to nab the killers at the earliest. Karnataka Home Minister Ramalinga Reddy condemned the incident, calling it unfortunate. He told reporters that the assailants probably fired seven rounds. "Within minutes, seven rounds were fired at close range. She was attacked outside her residence. As she had not sought police protection, no security was provided to her," Reddy said. Lankesh was convicted in a defamation case filed by BJP MP Prahlad Joshi over a report published in her tabloid against some saffron party leaders. In 2015, an Indian scholar, Malleshappa M. Kalburgi, was killed in a similar way, also in Bangalore. He was a critic of religious superstition. Several people in media and public life took to twitter to express shock at Lankesh's killing. "As a friend, colleague & admirer for decades shocked & shattered to hear of the murder of Gauri Lankesh, one of India's gutsiest journalists," said Vir Sanghvi, an eminent media personality. "If it is BJP ruled state, Liberals would have cried for emergency, Intolerance, Fascism," tweeted National Conference leader and former Jammu and Kashmir chief minister Omar Abdullah. Lawyer-activist Prashant Bhushan tweeted: "Shocking & tragic! Brave journalist Gauri Lankesh who exposed the BJP has been shot dead in her home in Bangalore!